Background: The glycolytic pathway plays an important role in tumor cells. Triosephosphate isomerase (TIM) catalyzes the reversible isomerization of D-glyceraldehyde-3-phosphate (GAP) to dihydroxyacetone phosphate (DHAP) in the glycolysis. Proteomics of a human prostate adenocarcinoma cell line revealed the presence of the G233D TIM variant, a new allelic type whose biochemical properties have not been reported . Objective: Provide the first biochemical and biophysical characterization of the allelic variant G233D of TIM. Methods: The Michaelis-Menten curves using both substrates of TIM were obtained. Also the effect of the competitive inhibitor phosphoenolpyruvate (PEP) was assessed in presence of GAP and DHAP. The thermal stability in absence and presence of PEP was analyzed by circular dichroism spectroscopy. For comparison purposes, all the measurements were carried out on the wild type TIM and variant G233D. 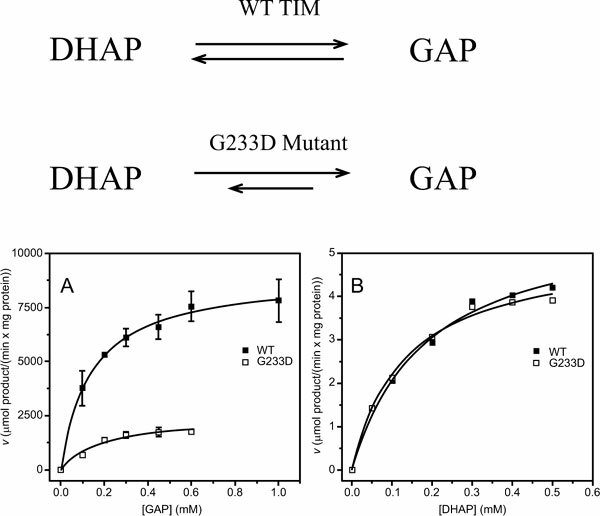 Results: The G233D variant exhibited a kcat value 4-fold lower than that of the WT enzyme in the GAP isomerization to DHAP, which is the reverse reaction of the glycolytic pathway. The G233D variant exhibited Ki and IC50 values of 120 μM and 356 μM in the presence of several concentrations of GAP and 0.3 mM DHAP, respectively. These inhibition parameters are similar to those exhibited by the WT enzyme. The thermal unfolding cooperativity of G233D variant was significantly increased upon PEP binding, suggesting that the ligand-bound enzyme was trapped in a rigid conformation. Conclusion: We suggest that the flow of GAP through glycolysis could be enhanced by the decreased activity of the G233D variant in the formation of DHAP. Keywords: Allelic variant, glyceraldehyde-3-phosphate, glycolysis, human prostate cancer, phosphoenolpyruvate, triosephosphate isomerase. Keywords:Allelic variant, glyceraldehyde-3-phosphate, glycolysis, human prostate cancer, phosphoenolpyruvate, triosephosphate isomerase. Abstract:Background: The glycolytic pathway plays an important role in tumor cells. Triosephosphate isomerase (TIM) catalyzes the reversible isomerization of D-glyceraldehyde-3-phosphate (GAP) to dihydroxyacetone phosphate (DHAP) in the glycolysis. Proteomics of a human prostate adenocarcinoma cell line revealed the presence of the G233D TIM variant, a new allelic type whose biochemical properties have not been reported .